I raved about Chromecast Audio when it launched last fall -- so four months later, does Google's $35 gadget still deliver? Our house is frequently filled with the sound of music. Not The Sound of Music as in "the hills are alive," mind you, but the sound of music as in "we like to listen to a variety of tunes (that may or may not involve Julie Andrews)." So back in October, I was pretty excited to pick up a few of Google's then-new Chromecast Audio streaming devices. If you aren't familiar with 'em, they're little $35 pucks that plug into existing speakers and make them "smart." Buzzword, buzzword, buzzword -- I know. All that means is that you can stream audio wirelessly to your old speakers without any fuss, just by using the regular music apps you already have on your phone, tablet, or computer. What's been great about Chromecast Audio for me and m'ladies (both wife and daughter -- she may not be able to operate a smartphone yet, but she sure does enjoy the music we play from them) is the simplicity of being able to easily move our music to wherever we happen to be in the house. Feeding the baby in the dining room? 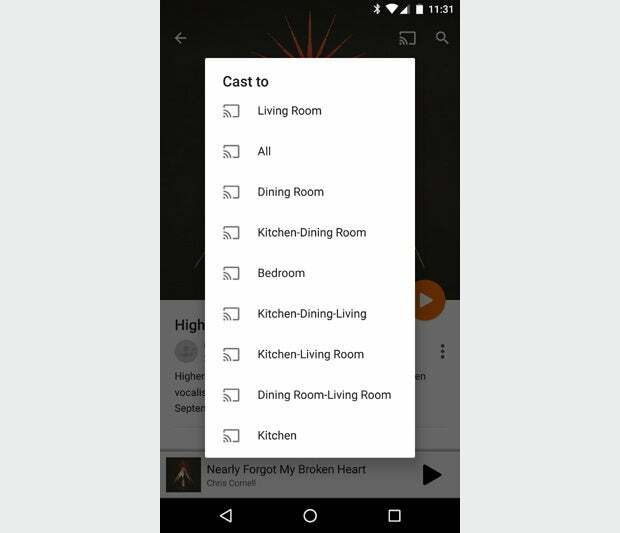 Open up Google Play Music, tap the cast button, tap Dining Room. Bam. Music playing. Time to head into the kitchen to work on our dinner? Open Play Music again, tap the cast button, tap Kitchen. Bingo-bango. The tunes keep going. The inexpensive little gadget was exactly the answer I'd been waiting for, as I said at the time -- a brilliantly simple solution to a problem that had been overcomplicated (and overly expensive!) for far too long. That was then, of course, and Chromecast Audio was still in its infancy. One of the system's most exciting features, a Sonos-like ability to cast audio to multiple speaker destinations at the same time, had yet to roll out. And that aside, the way a new type of technology seems in the first couple weeks often isn't the same as how it seems months later, once that new-gadget aura has started to wear off. So fast-forward to today, four months after I first brought Chromecast Audio into my home. Does it still deliver? The biggest change since my original evaluation, not surprisingly, is the addition of that aforementioned multiroom support. 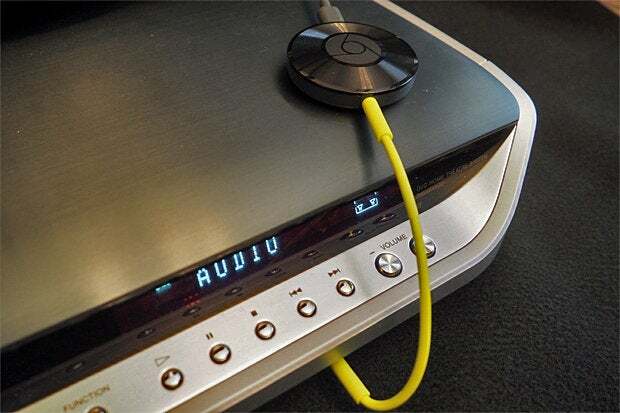 The feature showed up via an over-the-air update to all Chromecast Audio devices in December and brought a whole new level of power to my ad hoc home audio network. Now, in addition to being able to send music from our devices to any Chromecast Audio-connected speaker or stereo, we can send music to multiple speakers and stereos at the same time. It's just like what you can do with Sonos, except for a heck of a lot less money (assuming that, like us, you already have speakers or stereos in your home that can be used for such purposes; if you don't, this type of setup probably isn't right for you). I won't lie: The way Chromecast Audio's multiroom support feature works is a little confusing at first. Once you get everything set up the way you like, though, it's plenty easy to use. 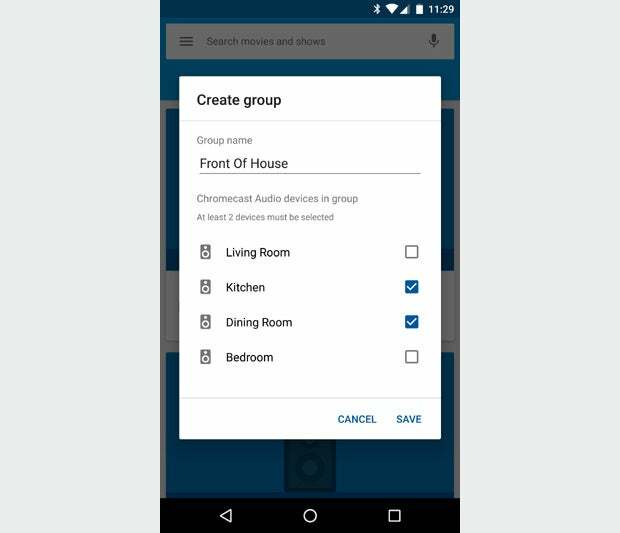 To start, you go into the Chromecast app on your phone or tablet and select a slightly hidden option to create a new speaker group. That brings up a list of your available speaker destinations. You then select the ones you want included in the group, give the group a name, spin around three times fast (optional), and hit "Save." From there on out, whenever you're in an app with audio-casting support -- be it an official Google app like Play Music or a third-party app like Pocket Casts or Pandora -- tapping the cast icon will show your newly created group as an option along with all of your individual speaker destinations. So, yes, that means you have to create specific groups for every possible speaker combination you might want, as you can see in the screenshot above. It's not the most elegant way to go about things -- it'd be far simpler, I think, if you could just check off the various speakers you want to include whenever you're casting instead of having to create a bunch of different grouping possibilities in advance -- but hey, c'est la vie. It may not be entirely ideal, but in day-to-day use, it also isn't that big of a deal. The other thing that's changed since my initial Chromecast Audio examination is the size of my streaming system. That's right, baby: My Chromecast Audio unit is bigger than ever, with two more devices added into the system since my original analysis. One of the extra devices goes with our main living room stereo, which is hooked up to a TV and also has a regular (video-based) Chromecast connected. Weird, right? Kinda: While we could already cast audio to that system via the regular Chromecast (provided the TV was on), we couldn't make it work as part of a multiroom audio-streaming group. That feature, as it turns out, works only with Chromecast Audio devices. So we're now using the regular Chromecast just for video casting (Netflix, Play Movies, and so forth) and using the Chromecast Audio for any audio-based streaming. The other extra Chromecast Audio I bought is connected to a portable Bluetooth speaker that usually sits in my daughter's room but can easily be taken anywhere else (including outside!). 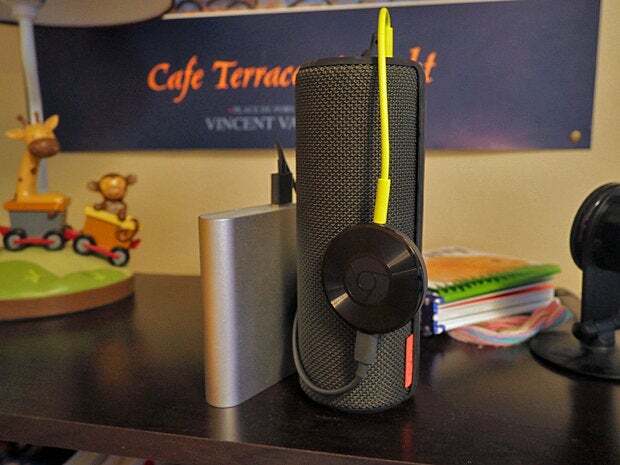 To keep it fully portable, I use a spare battery pack to power the Chromecast Audio device -- just a regular ol' USB power bank that sits behind it. I charge the battery pack whenever I charge the speaker itself, which seems to work out about right. By having the Chromecast Audio attached there, I can stream to that speaker as part of a multiroom setup -- so the same music that's playing in our living room and kitchen (or wherever) can play there, too. And as an added perk, the nature of Chromecast Audio streaming means I don't have to worry about draining my phone's battery via a power-hungry Bluetooth connection; even though the speaker is designed to support Bluetooth, I'm just feeding audio directly into its 3.5mm jack (via the Chromecast Audio device). All silliness aside, here's what it boils down to: Something like Sonos is a complete stereo system that gives you high-end hardware along with everything you need to stream music in multiple rooms throughout your house. Chromecast Audio is just that latter part -- the "everything you need to stream music in multiple rooms" bit. It's not about the hardware; that part is up to you. It's just about the connective tissue tying it all together. If you want a full-fledged sound system, Chromecast Audio isn't what you're after. But if you've already got a variety of speakers around and just want a simple way to make them all connected and ready for wireless streaming, you won't find a more versatile, affordable, or user-friendly way to do it. Even the von Trapps would agree.